Crawford Threads Ltd of Belfast Ireland produces high quality, durable linen threads. The fibers are saturated with wax, yet is still not sticky. The wax provides a protective coating that helps reduce wear from friction. It holds stitches and knots well. Crawford Irish Waxed Linen is ideal for knotted or braided jewelry, macrame, beading, book-binding, basket weaving, book making, leather sewing, scrapbooking and more. The multiple plies can be split into single plies for a thinner thread, if desired. 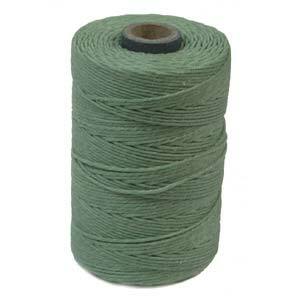 The 4-ply thread is about 0.9mm-1mm in diameter. The color between dye lots may vary, it is recommended to order enough to complete your design. Quantity: 1 spool. 50 grams, approximately 90-100yards.